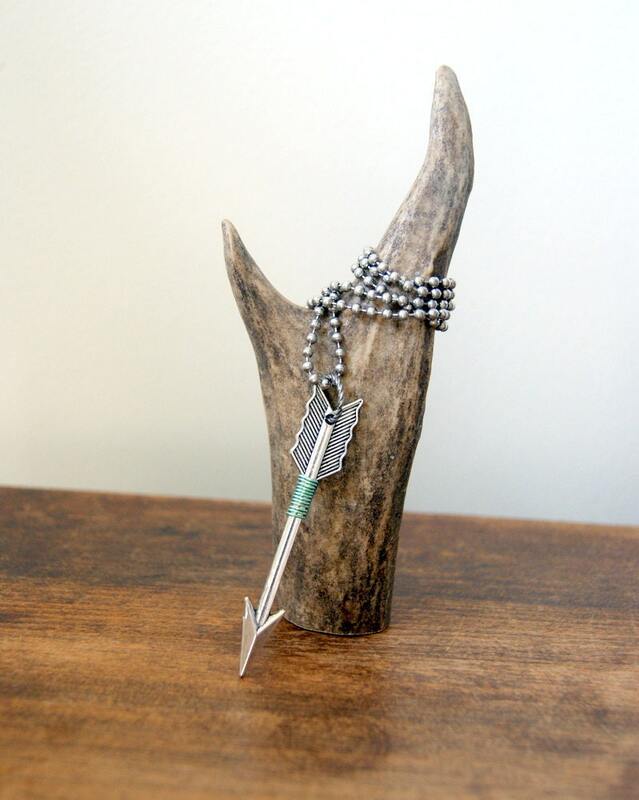 Select an option Cable 22" Cable 24" Cable 26" Cable 28" Cable 30" Ball 22" Ball 24" Ball 26" Ball 28" Ball 30"
Silver arrow necklace comprised of an antiqued silver tone arrow pendant measuring 2 1/2" or 64 mm , wrapped with mint green wire, hanging from a stainless steel ball chain. Also available with a cable chain. See the chain in the last photo. Choose length at checkout: 22". 24". 26". 28". 30". Perfect for layering or wearing alone. For you. For her. For him. For me. Want more than one arrow per necklace? I can do that! Each additional arrow is $8.00. Convo me and I'll be happy to set a listing up for you. All jewelry comes in rustic kraft gift boxes tied with bakers twine, jute string or wrapped in washi tape. FREE gift wrapping is available at checkout. You can see my current gift wrap samples on my about page. Leave me a message when you check out to let me know which paper you'd like. If you don't leave a message, I'll happily choose one for you. Very cute! Seller matched the rocks used to match a necklace I already had. Chain is a little weak, but I love the Adder Stone!!! That was the main bought item!!! Great silver feather. Details are amazing. I accept custom order requests. If possible, I can also modify a piece of jewelry to your specifications. Contact me with any and all questions or requests. Please note: I do not accept returns on custom items. If you see something you like, but it's not the length that you'd prefer, please contact me to see if I can adjust it for you before you purchase the item. Some necklaces can have the clasp switched from right to left to accommodate lefties, like me. Please ask if this is possible before placing your order. Many of my earrings can be converted to Clip Ons, free of charge. I have silver plated, oxidized silver plated, gold plated, antiqued brass and bronze with a coppery finish. Contact me on Etsy to see if the earrings in question can be converted. TN state sales tax of 9.75% is added to all TN sales. FREE gift wrapping is available at checkout. You can see samples on my About page. Leave me a message when you check out to let me know which paper you'd like. If I don't see a note, I'll choose one.